Sunday Stitch – Provisional Cast Ons! Provisional cast ons! They are great for when you know that you’ll be pulling out that cast on out later. Knitters have lots of cast-ons. Its kind of a thing. There is a popular book out there that promises to teach you 211 different ways to cast on and bind off. That seems like a lot to me. I think if I tried to learn that many I would accidentally erase some important piece of knowledge from my brain, like how to chew gum. But knowing a few different ways to cast ons (and bind offs) is helpful. In knitting classes I give more time to teaching cast ons over bind offs because, in my experience, a knitter will find a pattern, notice that it calls for a bind off that they don’t know and figure “Ehh. I’ll just wing it.” But if the pattern calls for a cast on that they don’t know, they’ll drop that pattern and find something else. So let’s talk cast ons, specifically the provisional ones. A provisional cast on is one that you intend to take out at some point. Its temporary. When you take it out, it leaves you a row of stitches, live loops, at the opposite end of your knitting. Why would you want to do this? It makes you feel clever when you do it all by yourself. Oh. You need more of a reason than that? Okay. Let’s say you are making a scarf and would like it to have a lace edging on the ends. If you start with a provisional cast on, you can make the body of the scarf followed by the lace edging on the bind off end. Then you can go back, pull out the provisional cast on, and work the lace edging on the cast-on end. Both ends will match perfectly. Let’s say you want to make a sock from the toe up. Most of those patterns start with a provisional cast on and work up and over the toe using short rows. Then the provisional cast on is pulled out and viola, you have two sets of stitches and can work in the round up the foot. Provisional cast ons are handy. There are lots of ways to make them and I’ll show you two. 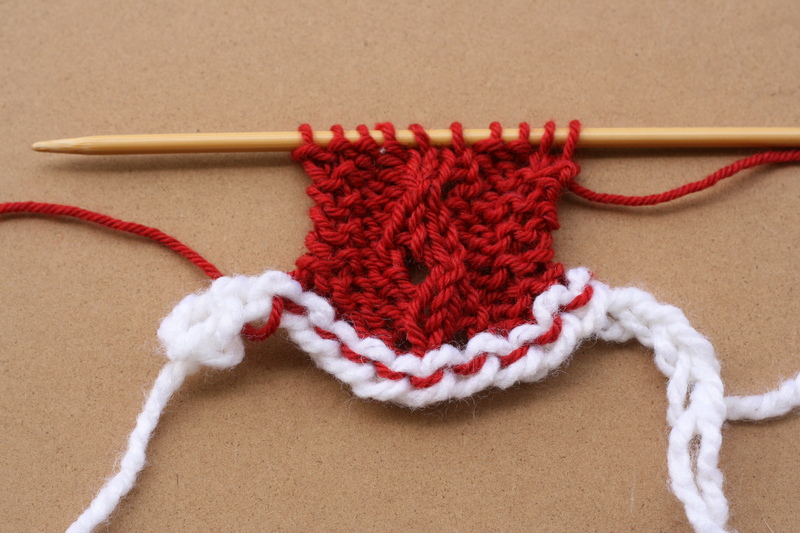 Making a provisional cast on with a crochet chain is perhaps the most common method. Its the one I show in the pictures above. Crochet a chain that’s longer then the number of stitches you need to cast on. Use the bumps of the back of that chain to pick-up-and-knit stitches with. After the knitting is finished/long enough, pull out the crochet chain stitch by stitch and slip each live loop to a knit needle. Judy Becker gave the knitting world her magic cast on in an issue of Knitty back in 2006. I don’t know if its magic but it sure is a neat trick. Technically its not a provisional cast on, since nothing is removed but I don’t care much about “technically”. This is a cast one that gives you two rows of live stitches. Its great for when you need a provisional cast on. Its also great for making toe-up socks. If you’ve ever started an in-the-round project with fewer than 10 stitches, you know how fiddly that can be. Start with this cast on and it will be MUCH easier. Yeah, I like Judy’s Magic Cast On. Its worth the time to learn. You will need two double pointed needles (or both ends of a circular needle) and a nice long tail. Be careful to keep your needles in the correct position, stacked one on top of each other. Any time you have to follow directions that involve twisting and turning your hands, its easy to get mixed up. I recommend holding your yarn/needles/hands exactly the way I do and work slowly until your hands catch the rhythm. After that, you’ll find a way that feels comfortable and works best for you. Hope that was helpful. We have more videos for knitters, crocheters and spinners. You can find them on our Tips, Tricks, and Videos page. 3 Comments on "Sunday Stitch – Provisional Cast Ons!" Thanks for these videos; I never can remember how to do a provisional cast on. Every time I use one, I have to either look it up in a book or search for one on YouTube, LOL. Then I happy to be on-the-spot with the videos! I actually have the cast-on bind-off book though I only use it when I need a certain type of bind off. My trick for the first cast on you did is to use a crochet hook the same size as my knitting needle to pull the yarn through the bumps. Personally, I find using a knitting needle to be a bit fiddly for me, so I just transfer onto the needle from the hook. I loved these videos!